Finance, foreign affairs, trade and the environment ministers quit Jammeh’s government as end of his term looms. The Gambia’s ministers for finance, foreign affairs, trade and the environment have resigned from President Yahya Jammeh’s government, according to ministry sources and state television. The resignations were announced on Tuesday less than a day after the country’s Chief Justice Emmanuel Fagbenle pulled out of a case filed by Jammeh seeking to stop the inauguration of President-elect Adama Barrow. Fagbenle said late on Monday that he could not hear the new case, dealing a blow to Jammeh’s efforts to halt the inauguration of Barrow, who remains in Senegal. The inauguration is scheduled for Thursday, when Barrow is expected to return from Senegal. “Given that the injunction affects me in my capacity as the chief justice, I will recuse myself from hearing it,” he said. Edward Gomez, a lawyer for Jammeh’s party, conceded that it was “certainly not possible under these circumstances” to have an injunction barring Barrow from being sworn in. On Tuesday, Morocco’s Foreign Minister Salaheddine Mezouar and a top secret service official arrived in The Gambian capital Banjul to hold talks with Jammeh, Al Jazeera’s Nicolas Haque reported from neighbouring Senegal. There have been talks of a possible asylum or exile for Jammeh to an African country, in exchange for him stepping down. The small West African country has been plunged into political turmoil since Jammeh disputed Barrow’s December election victory and refused to cede power. Jammeh has lodged a challenge to the election result with The Gambia’s Supreme Court and last week filed a fresh injunction to prevent the chief justice from swearing Barrow into office. Last week the Supreme Court said Jammeh’s challenge to the election result could not be heard for several months as it did not have a full bench, and the extra judges needed to hear the case were not available. The Gambia relies on foreign judges, notably from Nigeria, to staff its courts due to a lack of its own trained professionals. With tensions running high, Jammeh said on Sunday that he had spoken to Liberian leader Ellen Johnson Sirleaf and was adamant he would not budge until the Supreme Court had heard his challenge to the poll result. “The so-called deadline of January 19, 2017, is not cast in stone and all parties shall await the outcome of the Supreme Court,” he said on state television. Leaders of neighbouring countries and the Economic Community of West African States, or ECOWAS, have repeatedly called on the long-serving strongman to leave office peacefully, so far to no avail. 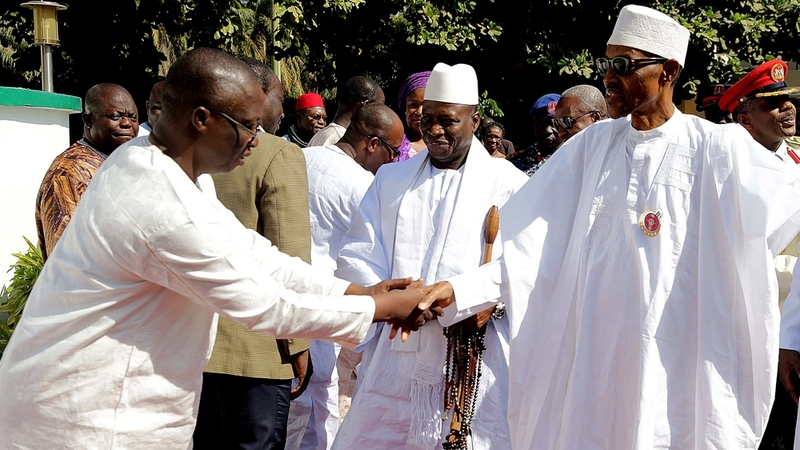 As well as Sirleaf, Nigerian President Muhammadu Buhari and Ghana’s President John Mahama, who left office 10 days ago, have appealed to Jammeh to step down twice in person, without success, most recently on Friday. Barrow was the surprise guest at a Bamako summit over the weekend, where he was welcomed as a head of state and introduced to several world leaders. On Sunday, a personal tragedy struck his family when his eight-year-old son Habibou died after being bitten by dogs, according to a family source. The prospect of military intervention in The Gambia has even been floated in recent days, following declarations by the United Nations and African Union that boots on the ground could get the green light without a rapid resolution of the crisis. The head of the UN Office for West Africa and the Sahel said on Friday that ECOWAS would ask the Security Council to approve the deployment of troops to The Gambia if Jammeh continues to refuse to leave office. On Friday, it was reported that the Nigerian military issued a memo to prepare 800 soldiers for a possible deployment in Gambia. There have also been reports that the Nigerian military has sought training and logistical support from British advisers before any military intervention. Before his inauguration on Thursday, Barrow’s special adviser Mai Fatty read a statement on his behalf in Dakar, urging Gambians to “exercise restraint, observe the rule of law and not to respond to provocation”.